Salons, spas and studios reward clients willing to go the extra mile. 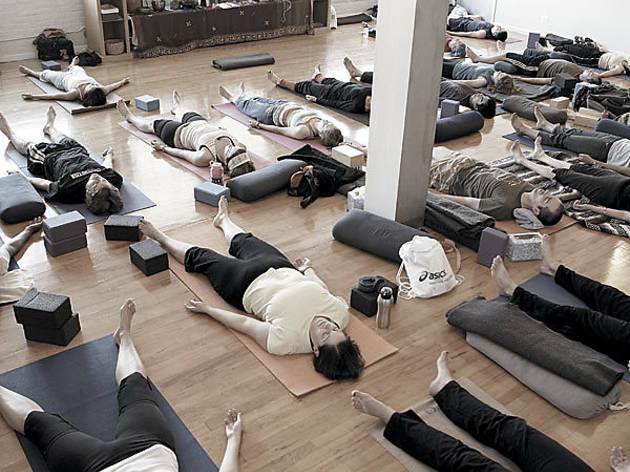 Photograph: Erika DuFour OM MY GOD It&rsquo;s crowded at Moksha&rsquo;s free yoga session. Many studios offer free community classes. We tried the weekend classes at Moksha Riverwest (700 N Carpenter St, 773-975-9642; Sundays 3:30–5pm) and Yoga Now Edgewater (5852 N Broadway, 773-561-9642; Sundays 6–7:30pm). The instructors were solid, the participants were fully engaged, and we felt tuckered and limber by the end of each lesson. As part of the Midwest College of Oriental Medicine (909 W Montrose Ave, suite 201, 773-975-1295), this free clinic offers acupuncture and nutritional and herbal consultations. After answering a lengthy questionnaire (on everything from my sleeping patterns to my bowel movements) in a crowded waiting area, I received 25 minutes of acupuncture with a student. Afterward, I felt relaxed and my back pain had temporarily eased up. On Monday and Tuesday, first-time clients can sign in from 2–7pm. For returning visitors, the free acupuncture is Monday, Tuesday and Thursday 1–7pm, and Wednesday and Friday 1–3pm. A few days a month, facialist Ezzat Goushegir is on call at the Fresh counter in Macy’s (111 N State St, 312-781-3699, call ahead for an appointment). In a private, candlelit treatment room, she performs 30- to 45-minute facials with Fresh goodies. If there’s time, clients get a quickie rundown on the products used and why. The experience is so calming and lovely that I practically floated back to my cubicle.